Bilingualism is an essential pillar at Ermitage. 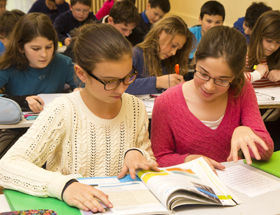 Students receive instruction in both French and English and are placed in language groups based on past performance and teacher recommendation. Ermitage teachers aim to foster fluency in both languages while striving for high academic achievement across the curriculum. Students are encouraged to develop skills that allow them to understand, analyze and reflect upon a wide spectrum of materials. Students learn to conduct personal research and hone their verbal communication skills. Written work is assessed through knowledge tests, essay writing and research projects. Oral work is graded based on each individual’s participation in class discussion and debate. In the 6e year, students are evaluated in order to determine the level of bilingual fluency. For those students who need to reinforce a particular language, FLE (Francais Langue Etrangere) and ESL (English as a Second Language) classes are offered. For students who have achieved a comfortable level of fluency in both English and French, we offer the possibility of learning a third language in their 6e year. Dependent on sufficient numbers to sustain a class, students may opt for Spanish, German or Mandarin for three hours a week.